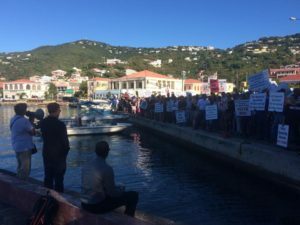 Jennifer Augspurger (VIPCA Secretary and S/V Starfish) spoke at the waterfront rally protesting bill 32-0005 with regards to its direct impact on the yacht charter industry. Adam Reeve testified on behalf of the marine charter industry was the result of VIPCA spending two days in chambers and multiple meetings with Senators. The charter industry is beginning to be listened to and progress being made. VIPCA is still pushing stop this bill 320-0005 in its path. Next Next post: Excise Taxes on Boats, what do they mean?